You don’t have to just enjoy Belfast’s foodie revival from distance, there are plenty of ways you can get more ‘hands on’ and create some local flavours for yourself! We’ve chosen some perfect ways to roll your sleeves up and be part of the local food scene. Who better to teach the art of working with fine chocolate than Co Couture (Chichester Street, close to City Hall). This award-winning chocolatier hosts chocolate masterclass events which are as a delicious as they are great fun. Local newspaper The Irish News recently celebrated shop owner Dierdre McCanny by outlining her superb achievements: “A ‘gold’ champion at the International Chocolate Awards in England last year, the fresh mint and honey combo has emulated the early success of an innovative Irish whiskey truffle – her first Great Taste award winner. The list of chefs behind the superb Belfast Cookery School reads like a guide to the biggest names int the local culinary scene. The cookery school offers classes for all tastes and abilities, from learning to cook the perfect steak to creating Italian and French cuisine. Once you’ve cooked your own taste sensation your new knowledge is yours to recreate for family and friends as often as you’d like! The iconic Mourne Seafood Bar also offers their famous seafood cooking classes in the County Down fishing town of Kilkeel. The Mourne Seafood Cookery School gives guests a chance to create, learn about and enjoy superb food in the company of a local chef. 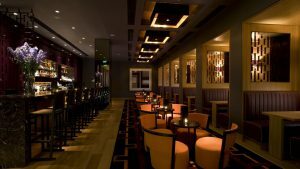 This one isn’t food…but something foodies will love: for a great fun way to enjoy cocktails, ask the Fitzwilliam Hotel about their mixology masterclass group events. The hosts promise to ‘share the secrets to mixology’: “You and your friends will learn how to build a drink, stir, shake, layer, muddle, strain, smash. And drink. A price of £30 per person includes wine and canapés on arrival plus two cocktails.